Duo is a third-party provider that ASAP has partnered with to help keep your data safe and secure. Please refer to Duo's homepage to learn more about them: https://duo.com/. Multi-factor authentication (MFA), or two-factor authentication, incorporates an additional verification step into the log in process. Traditional logins require that you have certain knowledge (e.g., knowledge of a password). The problem is that sometimes passwords get stolen. Two-factor authentication requires that users have a password and access to a physical device, such as a phone. If your password is compromised, your data is still secure because of this second layer of verification. You can read a detailed description about MFA here: https://guide.duo.com/. How will Duo work with my specific device? Please find the link for your specific device from the selections below. 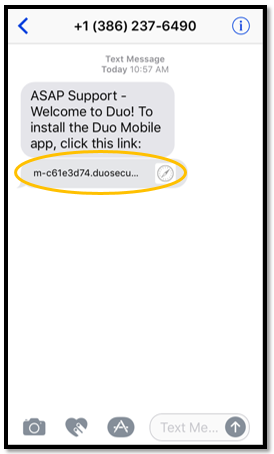 How do I install the Duo app and activate my ASAP Duo account? 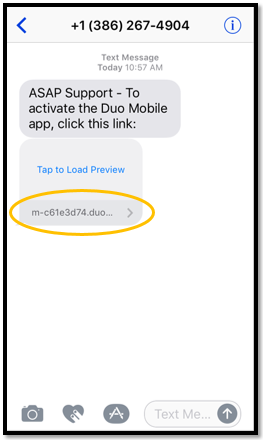 ASAP will send you two text messages from Duo. The text messages serve different purposes and you must complete them in the correct order. 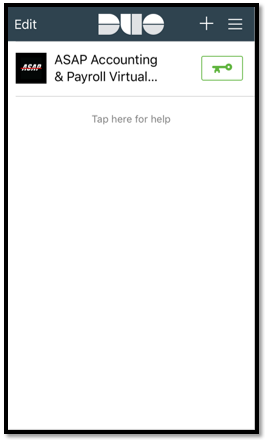 The first text will be an invitation to download the Duo app to your mobile device. Click the link in the text message to be directed to the app store to download the app. 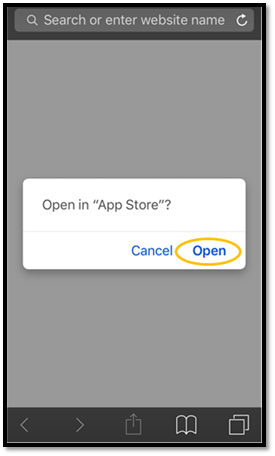 The link will redirect you to a webpage and ask whether or not you want to "Open in 'App Store'?" Select Open. 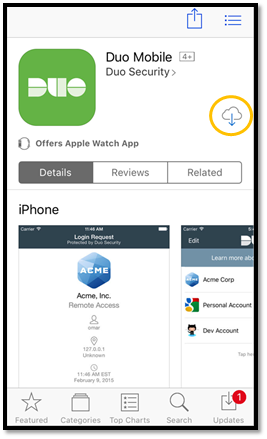 Select the cloud icon to download the application. Once the download is complete, the cloud icon will change to an Open icon. 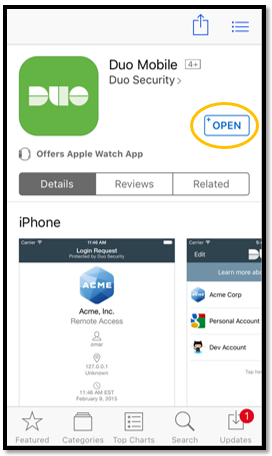 Select the icon to open the application. 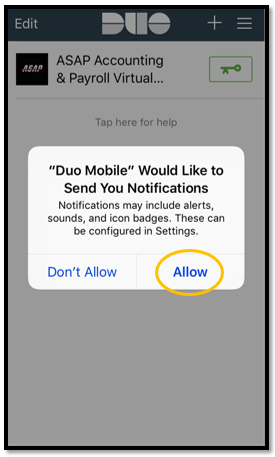 Once you select allow, you do not need to remain in the Duo app. It may prompt you to enter a code or take a photo of a barcode. 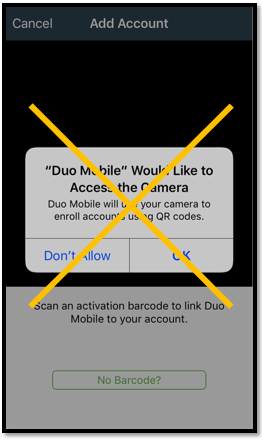 You do not need to allow Duo to access your camera. 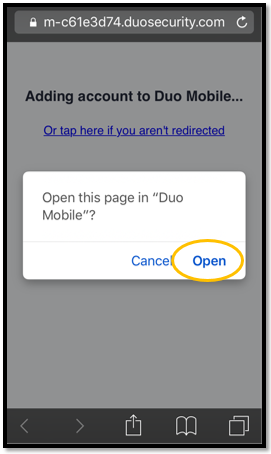 The link will redirect you to a webpage and ask whether or not you want to "Open this page in 'Duo Mobile'?" Select Open.